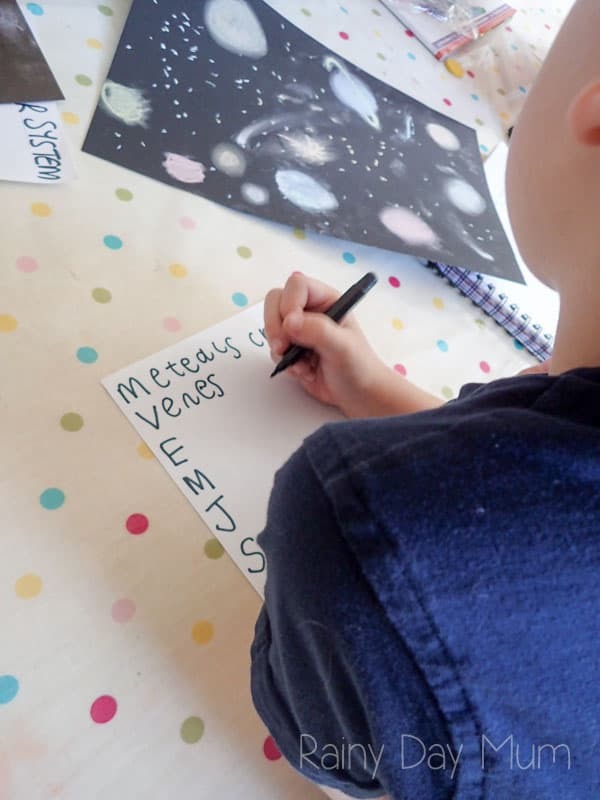 Apart from animals my eldest’s second favourite topic is space, but he’s not really interested in aliens and sci-fi he loves facts. Lots and lots and lots of facts, over the years he’s been picking up bits and pieces so I decided that with this week’s Poetry theme for the 2nd-grade blogging team we would use a combination of Science, Art and Literacy to produce some fact based poetry and also to teach him a simple mnemonic that I learnt when I was his age for remembering the order of the planets in the solar system. 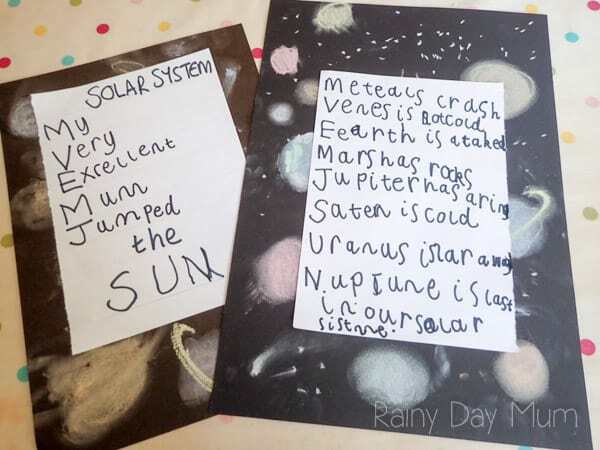 We started out with some Solar System fact books – I love the Usborne Big Book of Stars & Planets [affiliate link] and it’s our go-to book for his age range about the Stars, Planets and Space. It folds out with giant pictures to explain the facts in more detail and has enough detail that it doesn’t overwhelm him especially as he’s a fact seeker. 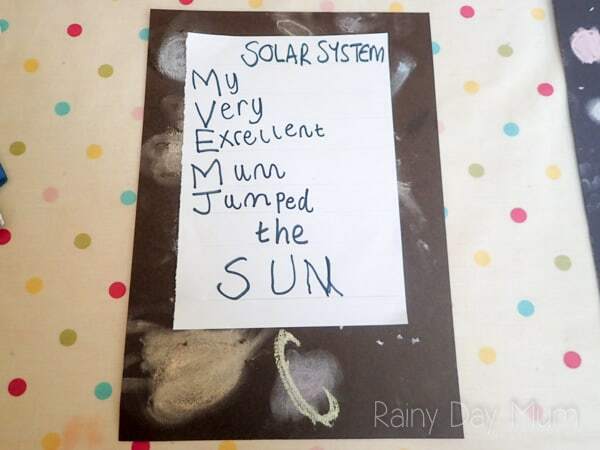 After reading the book we set about using our knowledge of the solar system to create a poem based on the first letter of the planets in the solar system and using some art and skills to create the picture. 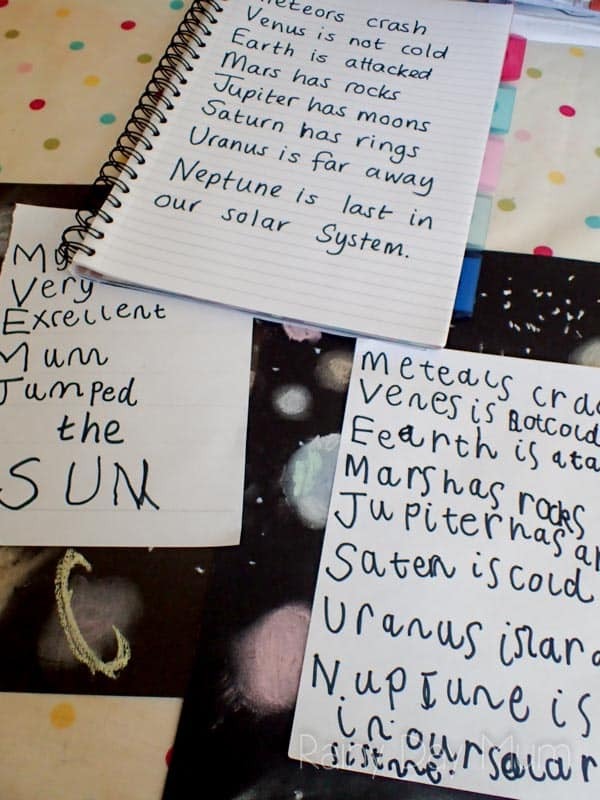 Looking for more Space Themed Literacy Activities then try Writing Silly Space Sentences a fun way to work on sentence development with kids. Start off by reading non-fiction books about the solar system, including the order of the planets – depending on the age of your book there maybe some discussion about Pluto – as it has been declassified as a planet and now is not one of the ones in the Solar System. We are also only using the known planets Mercury, Venus, Earth, Mars, Jupiter, Saturn, Uranus and Neptune none of the new planets that have been discovered recently. 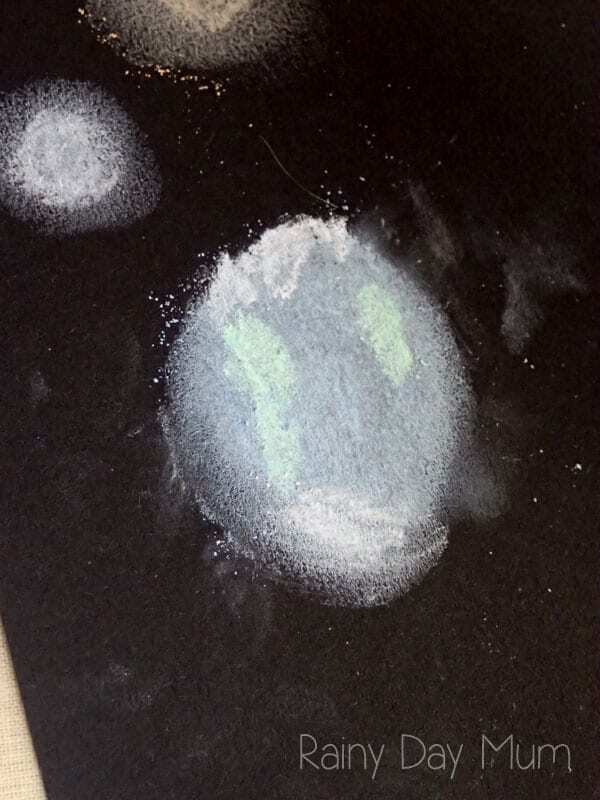 Starting off with a sheet of black paper we created a sun with yellow pastel and I showed the technique of rubbing the pastel in to get a nice coverage and also a “Halo” effect for the sun and the planets. Then J drew planets around the piece of paper towards the outer edge he added continents to earth, made Mars red because of the rocks, Jupiter the biggest and Saturn had to have rings. 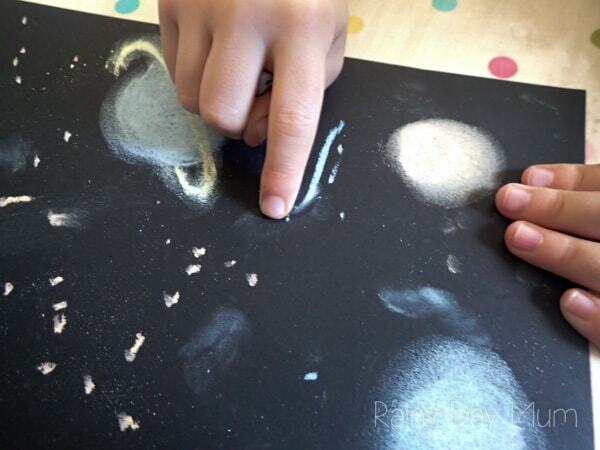 We then added stars by making dots over the planets – which led to a discussion about how many planets does each star have around them and when will we find out! 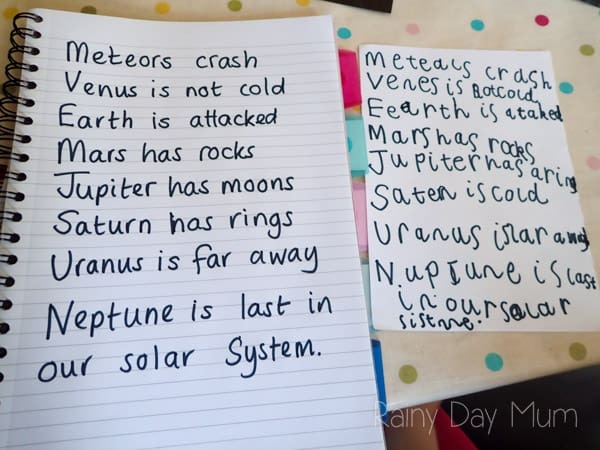 I then on a second piece of white paper marked out the first letters of each of the planets and he set about creating a poem to help him remember the order of the planets and about the solar system. 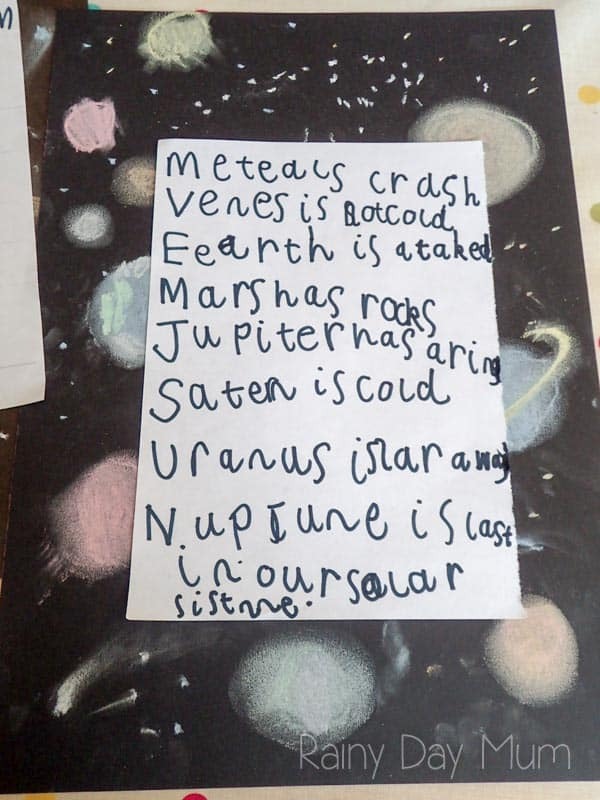 He started the first phrase not wanting to use the name of the planet like I had in my mnemonic – but after the first line he decided it would help him remember creating his own poem starting the line with each planets name and a fact about them. 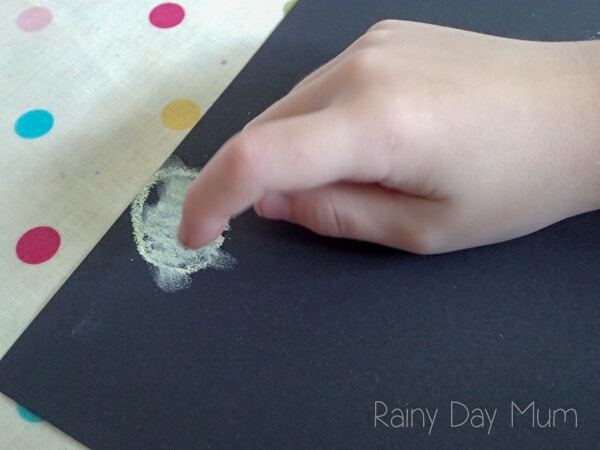 Once he had written he poem we stuck it to the black paper in the middle. I also wrote out his poem with the spelling corrections and I will be adding them to our spelling list of words this week. I love how this turned out – poetry, art, and science in one!